Earlier this month I decided to experiment with long exposure shots. I chose the full moon as my subject. I set my camera up on a tripod and pointed it at the sky. The moon is very difficult to photograph, at least for me. It’s constantly moving, which means your shutter speed can’t be too long or else the moon will be blurred. I had to use a remote to release the shutter so I wouldn’t shake the tripod in any way. 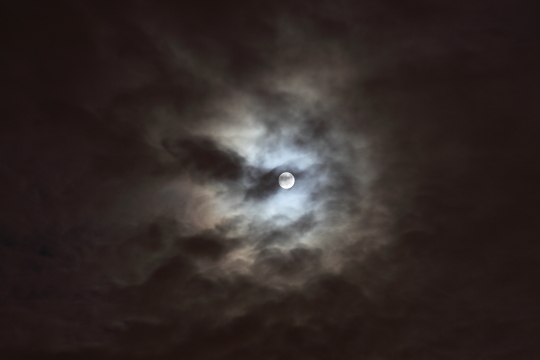 The thing I liked about the sky that night was the clouds around the moon and the eerie way they were being lit. Ideally I wanted a perfect moon exposure and a perfect cloud exposure in the same shot. However, there are limitations to what you can get the camera to do so I just had to settle for a happy medium between the two. As you can see in the shot below the moon is overexposed on one side but I love the way the clouds look. Photo Info: Taken with the 5D Mark II at ISO 200, F4 at a 1.6 second shutter speed.